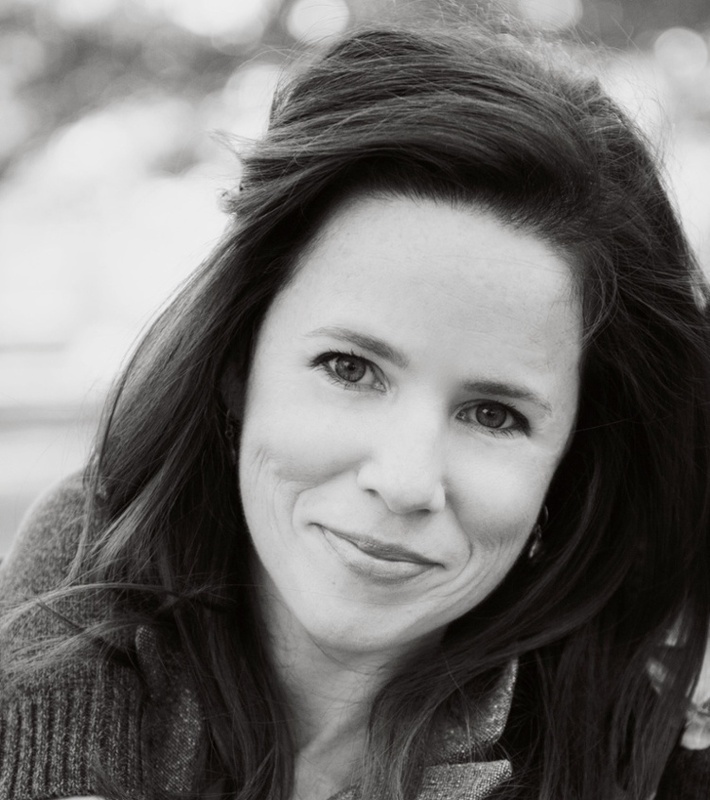 So you've tackled regularly posting to Facebook (and other social channels). You're also in the habit of showing the personality of your practice, as well as giving helpful content to your existing patients. However, just because you have followers on Facebook does not mean they see your posts. Business pages on Facebook are continually seeing reduced organic (non-paid) reach, and it will increasingly become a platform where practices will need to put funds behind their content in order for it to be seen, including to your own followers. In this pay-to-play atmosphere, it is time to hone your skills at social media advertising, and Facebook is a great platform to hyper-target your current and ideal patients. Where pay-per-click platforms like Google are based on keyword search and geography, the Facebook ad platform takes those components plus adds demographics, income, and interests. So you can precisely target your ads to reach your desired patient base. And with Facebook ads you can also target your own patients by uploading your active patient emails to create a custom audience of those that are viable Facebook users. When you advertise to your patient base, it helps to raise awareness and reinforce your treatments, and could result in increased case acceptance. The cool part: once you have a Facebook audience that knows and loves your practice, you can find more Facebook users just like them by creating a Lookalike Audience. Facebook Lead Ads is a new type of ad format that allows you to use quick and easy forms in the ads to get contact info from your leads. From Facebook: "Collect information from people interested in becoming your customer with lead ads. Lead ads look like regular Facebook ads but when a person clicks your ad, they will see a form that’s already filled with info they’ve shared with Facebook—like their name, phone number, or email." 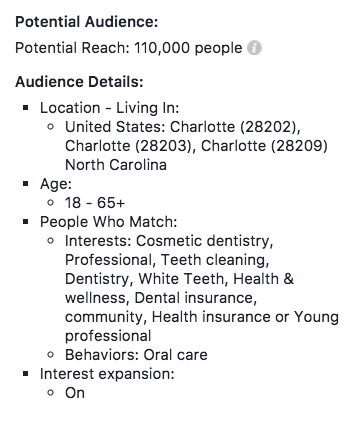 Dental practices can use Facebook lead ads when you have something to offer, such as "Free whitening for the first 50 respondents", or "Save your spot for your Single-Visit crown consultation and estimate". Once you have contact information, you can follow up with personalized communication, and even advertise to them again. If your patient goes to your website page for Invisalign, will they just see a lot of text, and perhaps a neutral headline, like "Invisalign Treatment in [insert city here]"? Or will they see photos of treatment results, perhaps watch a video of a Clincheck, and best of all, be able to click a button to sign up for their complimentary consultation, and be led to a short form to submit their info for ideal times? Or do have a downloadable resource, such as an e-book on "What to Expect with Invisalign", and you offer a short form for their free copy? These more robust options represent optimizing a website page to do the silent marketing work for your practice, and convert visitors into leads, and to convince existing patients to finally get the treatment. Your website is only working if it brings you leads. The way to stay focused on that goal is to look at each page of your site as a "Landing Page" - a page that has a focused objective to deliver quality to the viewer and to get them to share their info with you, and move closer to becoming a patient or agreeing to have a particular treatment. 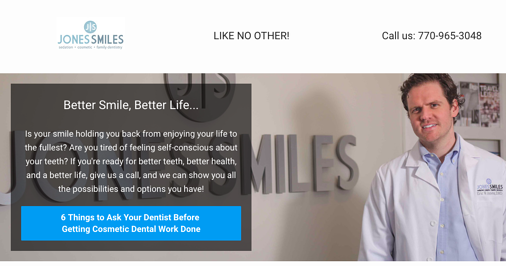 Think of your website pages as salesmen for your practice at 11pm or 5am - when your practice is closed, your website pages can still close the deal! Check out our blog "19+ Essentials for Your Modern Dental Practice Website". You can optimize your website pages into landing pages yourself, or you can use plug and play web based tools, such as Leadpages, Click Funnels, or Unbounce. These services offer page templates that can work with your existing website, using proven layouts, graphics and calls-to-action to get your lead to complete an intended action. Perhaps over time you've gotten lucky, and your patients have left positive reviews for your practice on Google, Facebook or Yelp. 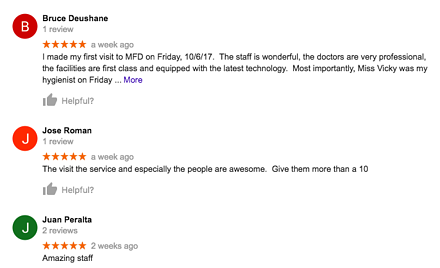 Or maybe you have a practice culture where every team member asks happy patients to leave reviews so you have a constant flow of 5-star ratings. If so, that's great. But if you're struggling for reviews, and the last one on Google is from last February, then you might want to stop banging your head and sign up for an online review management service. Industry popular services include BirdEye and Signpost. They request and manage customer reviews, as well as surveys, via post-visit emails. Then, the reviews can be shown on your website and posted to your social media pages. Some of these services can also intercept negative reviews, and give you a chance to respond, and address or correct an issue, before it is blasted out to the public. Because the review requests are automated and make connection with every recent patient, you are sure to get a steady flow of patient feedback to the important review sites, which in turn will be seen by potential patients -- making your patient base part of your marketing team! With more than 240 million smartphone users in 2017, it is clear that the in-the-moment communication method of texting/SMS (Short message service) will only continue to grow. In a national survey, survey respondents stated that "they read 82 percent of their text messages received from businesses within five minutes. In comparison, consumers only open about 1 in 4 of emails sent by businesses." 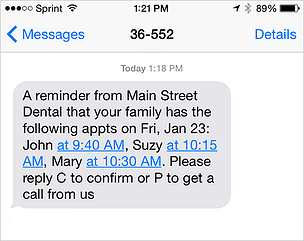 Additionally, 55 percent preferred to get appointment reminders via text vs. 35 percent preferring email. Dental practices that use this method can increase convenience for the patient, while also increasing revenue. SMS communication can reduce appointment no-shows, and also allow you to fill scheduling holes and work through wait lists quickly. While the patient receives attentive service, the practice's operating costs reduce by filling down time. Here we are featuring the appointment reminder service from RevenueWell practice management software, and other a la carte providers may also be available. By bringing fresh marketing trends into your practice you could also bring fresh leads, and the opportunity to grow beyond the status quo. 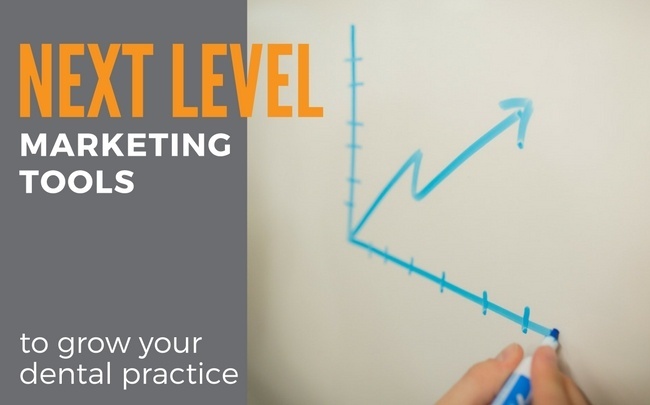 If you'd like some help taking your practice to the next level, our team of dental-experienced marketers will be happy to guide you. Contact us for a complimentary assessment of your dental practice.